Addresses the problem of allocating capital to assets on a long only basis, or to trading strategies. It won't be suitable for a long /short portfolio. This is the third in a series of posts on the handcrafting method. In this, the third post, I'll explain how you'd actually apply the method step by step, with code. a spreadsheet based method suitable for small numbers of assets where you need to do a one-off portfolio for live trading rather than repeated backtest. It's also great for understanding the intution of the method - a big plus point of this technique. a python code based method. This uses (almost) exactly the same method, but can be backtested (the difference is that the grouping of assets is done manually in the spreadsheet based method, but automatically here based on the correlation matrix). The code can be found here; although this will live within the pysystemtrade ecosystem I've deliberately tried to make it as self contained as possible so you could easily drop this out into your own framework. I'm going to use long only weekly returns from the following instruments: BOBL, BUND, CORN, CRUDE_W, EURODOLLAR, GAS_US, KR10, KR3, US10, US20; from 2014 to the present (since for some of these instruments I only have data for the last 5 years). Because this isn't a proper test I won't be doing any fancy rolling out of sample optimisation, just a single portfolio. The descriptive statistics can be found here. The python code which gets the data (using pysystemtrade), is here. Group the assets hierarchically (if step 1 is followed, this will form the top level grouping). This will done either by (i) an automated clustering algorithm or (ii) human common sense. Calculate volatility weights within each group at the lowest level, proceeding upwards. These weights will either be equal, or use the candidate matching technique described in the previous post. (Optionally) Calculate Sharpe Ratio adjustments. Apply these to the weights from step 3. Calculate diversification multipliers for each group. Apply these to the weights from step 4. Calculate cash weights using the volatility of each asset. (Optionally) if a risk target was used with a manual method, partition the top level groups into high and low volatility. (Optionally) if a risk target was supplied; use the technique outlined in my previous post to ensure the target is hit. A suggested grouping is here. Hopefully it's fairly self explanatory. There could be some debate about whether Eurodollar and bonds should be glued together, but part of doing it this way was to see if the diversification multiplier fixes this potential mistake. The calculations are shown here. Notice that for most groups there are only one or two assets, so things are relatively trivial. Then at the top level (level 1) we have three assets, so things are a bit more fun. I use a simple average of correlations to construct a correlation matrix for the top level groups. Then I use a weighted average of two candidate matrices to work out the required weights for the top level groups. Adjustments for Sharpe Ratios are shown in this spreadsheet. You should follow the calculations down the page, as they are done in a bottom up fashion. I haven't bothered with interpolating the heuristic adjustments, instead I've just used VLOOKUP to match the closest adjustment row. DM calculations are shown in this sheet. DMs are quite low in bonds (where the assets in each country are highly correlated), but much higher in commodities. The final set of changes in particular striking; note the reallocation from the single instrument rates group (initial weight 30.7%, falls to 24.2%) to commodities (initial weight 29%, rises to 36.5%). (Almost) finally we calculate our cash weights, in this spreadsheet. Notice the huge weight to low volatility Eurodollar. Risk target lower than 1.09%, eg 1%: We'd need to add cash to the portfolio. Using the spreadsheet with a 1% risk target you'd need to put 8.45% of your portfolio into cash; with the rest going into the constructed portfolio. Risk target higher than 1.09% without leverage: You'd need to constrain the proportion of the portfolio that allocated to low risk assets (bonds and rates). The spreadsheet shows that this comes out at 31.4% cash weight, with the rest in commodities. I've also recalculated the weights with this constraint to show how it comes out. The handcrafting code is here. Although this file will ultimately be dumped into pysystemtrade, it's designed to be entirely self contained so you can use it in your own applications. The code expects weekly returns, and for all assets to be present. It doesn't do rolling optimisation, or averages over multiple assets. I need to write code to hook it into pysystemtrade, and to achieve these various objectives. I won't document the API or methodology fully here, but hopefully you will get the idea. So all the bonds get put into one group, the other assets into another. Seems plausible. There are now two top level groups as we saw above. # play with this line at your peril!!! However I've found the results to be very similar regardless of the method used. The portfolio in the python code is built up in a bottom up fashion. Let's see how this happens, by focusing on the 10 year US bond. You can see that US bonds are more highly correlated with asset 0 and asset 2, than they are with each other. So it gets a lower raw weight. It also has a far worse Sharpe Ratio, so get's further downweighted relative to the other countries. The first row is the vol weight of the asset within it's group; we've already seen this calculated. The next row is the vol weight of the group as a whole; again we've already seen the figures for US bonds calculated above. After that is the diversification multiplier for the US bond group. Finally we can see the volatility weight of US 10 year bonds in the bond group as a whole; equal to the vol weight within the group, multiplied by the vol weight of the group, multiplied by the diversification multiplier of the group; and then renormalised to add up to 1. The most striking difference to the spreadsheet is that by lumping Eurodollar in with the other US bonds it has a much smaller vol weight. German and Korean bonds have gained as a result; the energies and Corn are pretty similar. Risk target lower than 1.59%, eg 1%: We'd need to add cash to the portfolio. With a 1% risk target you'd need to put 37.3% of your portfolio into cash; with the rest going into the constructed portfolio. In this case the portfolio to constrain the proportion of the portfolio that allocated to low risk assets (bonds and rates). In the next post I'll test the method (in it's back testable python format - otherwise (a) the results could arguably be forward looking, and (b) I have now seen more than enough spreadsheets for 2018 thank you very much) against some alternatives. It could take me a few weeks to post this, as I will be somewhat busy with Christmas, university, and book writing commitments! This is the second in a series of posts on the handcrafting method. In this post I build up the various components of the method, and discuss why they are needed. In next post, I'll explain how you'd actually apply the method step by step, with code. 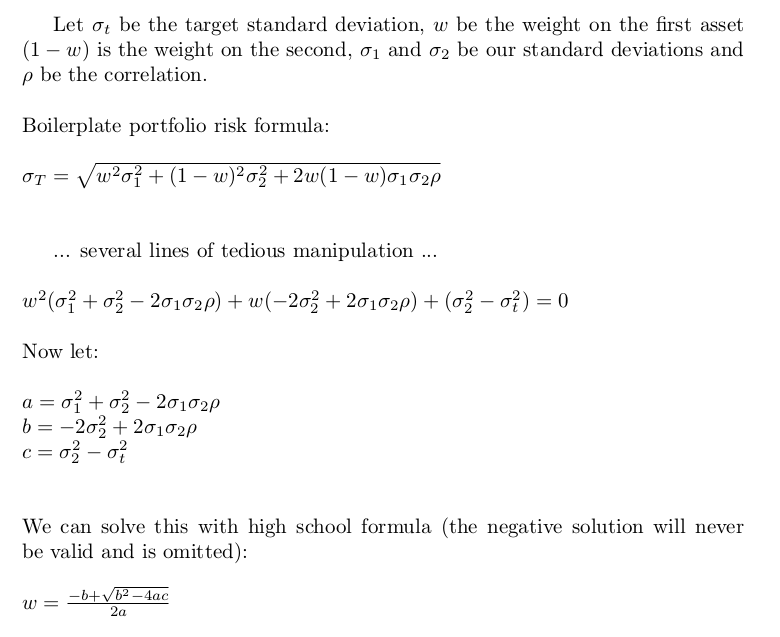 This method does share some common ground with hierarchical risk parity (HRP)*. * To reiterate I did come up with the method independently of HRP: I first became aware of HRP in early 2017, but I've been using handcrafting in one form or another for several years and my book containing the concept was written in 2014 and 2015, and then published in October 2015. Having said that the core idea of handcrafting is that it reflects the way humans naturally like to do portfolio construction, so I'm not sure anyone can really claim ownership of the concept. Indeed in some ways you could think of it as HRP broken down into steps that make intuitive sense to human beings and can be implemented using only a spreadsheet). However as you'll see there are some fundamental differences involved. Everyone loves equal weights. High falutin academic finance types like them (see here). More importantly human beings like them too. Benartzi and Thaler find that when people do diversify, they do so in a naive fashion. They provide evidence that in 401(k) plans, many people seem to use strategies as simple as allocating 1/n of their savings to each of the n available investment options, whatever those options are. ... then equal weights are the optimal portfolio. For highly diversified indices like the S&P 500 equal weights are going to do pretty well; since these things are close enough to the truth not to matter. But in many other cases they won't. They're not. Standard deviations in general are the most predictable characteristic of an assets returns. Their sampling uncertainty is lower than for any other estimate. So an equal weighted portfolio for the S&P 500 (standard deviation ~16% a year) and US 2 year bonds (standard deviation ~2% a year) doesn't make sense. It will get most of it's risk from equities. The solution is to use inverse volatility weighting. We give each asset a weight of 1/s where s is the standard deviation. Except for certain special cases this won't produce nice weights, so we'll have to normalise these to sum up to 1. For S&P 500 & US 2 year bonds we'd get weights of 1/.16 and 1/.02, which once normalised is 11.1% and 88.9%. We now have two different ways of thinking about weightings: cash weightings and volatility weightings. For our simple example the cash weightings are 11.1% & 88.9%, and the volatility weightings are 50% & 50%. To convert from volatility weighting to cash weighting we divided by the standard deviation of each asset, and then normalise weights back to 1. To convert from cash to volatility weighting we multiply by the standard deviation, and then normalise weights back to 1. Note: if allocating capital to trading strategies then this step will not be necessary. If built properly trading strategies should target a given long term risk level. Small differences in the actual risk level should not be used to vary the portfolio weights that they are allocating. There is one fatal flaw with the inverse volatility approach. Consider the portfolio of 11.1% in S&P 500 and 88.9% in US 2 year bonds; this portfolio will give us risk of between 2.5% and 3.5% depending on the correlation. For most people that's *way* too little risk. Or to be precise for most people that's *way* too little return: if each asset had a Sharpe Ratio of 0.5 (which is rather punchy for a long only asset) that would give an expected excess return of around 1.8%. That's fine if you can use leverage; then all you need to do is use a leverage factor of target risk divided by expected risk. 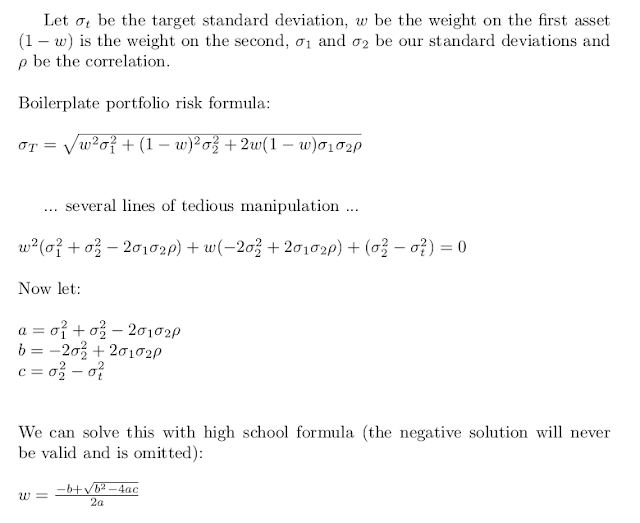 For example if you're targeting 10% risk and the correlation is 0.5, giving risk of 3.1%, then you'd apply a leverage factor of 3.2. * There will be precisely two digs at MBAs in this post. It's nothing personal. Some of my best friends have MBAs. Actually that isn't true, I don't have any friends with MBAs, but I'm sure that people with MBAs are harmless enough. Let's try it with our simple example. From the sheet with a portfolio risk target of 10% and a correlation of 0.5 we get a weight of 59.8% on the first asset (the S&P 500), 40.1% on the second (US 2 year bonds). Translated into volatility weightings that's 92.3% on the S&P 500 and 7.7% on the US 2 year. For very high risk targets the spreadsheet will produce a value for the weight on the first asset above 1. Clearly you can't achieve risk of 17% without leverage if the riskiest asset you have as risk of 16%. For very low risk targets the spreadsheet will produce inefficient weights or errors, eg for a target of 2.5% it will want to put 94% in the US 2 year bond; but this would produce a lower return than allocating 18.8% of your portfolio to cash and the rest to the inverse volatility portfolio. See this second sheet. If the risk target is lower than the 'natural' risk of the constructed portfolio, then use the constructed portfolio and add cash as required; proportion of cash = (natural risk - risk target) / natural risk. Then multiply the natural weights of the constructed portfolio by (1- proportion of cash). We know what to do if we can forecast volatility, but what about correlations? The parameter uncertainty on correlations is a little higher than volatility, and they aren't quite as easy to forecast, but in many portfolio problems it's going to be madness to ignore correlations. Doing equal volatility weighting would put 1/3 of our portfolio risk into each of these three assets. So two thirds of our portfolio risk* would be in bonds. This doesn't make a lot of sense. * not quite. I'll relax this approximation later. The way to deal with this is by creating groups. Groups contain assets that are similar, with similarity measured by correlation. Grouping can be done purely by humans, or if you want to back test the method it can be done automatically [and I'll explore how in the next post]. The results probably won't be especially different, however it's important we can back test this methodology, even if we end up using human determined groups in live trading (which indeed is what I do myself). In this case the groups are obvious: a group of two bonds, and a group containing a single stock. Once we've got our groups together we follow the procedure: allocate to the groups, then allocate within the groups, and then multiply out to find the final weights. These are volatility weightings - we'd need to divide by risk and normalise to get cash weights. We'd probably split this into two groups: assets A and B (quite similar) , and asset C (quite different). Assuming they all have the same standard deviation (say 10%), the standard deviation of the sub portfolio AB (with 50% in each) will be 8.66%; lower than 10% because the correlation is 0.5. The standard deviation of the sub portfolio C which only has one asset is just 10%. If we put half our portfolio into AB and half into C, then we'll actually have over allocated to portfolio C since it's riskier. To correct for this we need to work out the diversification multiplier; this will produce the correct result without having to go through the slightly more complex task of working out the estimated risk of each portfolio, resulting in a more intuitive process. Or if you prefer a spreadsheet, there is one here. The diversification multiplier is just the ratio of the risk of the group to the risk of a single asset. With larger groups it will get larger. With lower correlations it will get larger. Again play with the spreadsheet, and even the most moronic MBA will eventually get the intuition here. The multiplier for group AB comes out at 1.155, and for group C by construction it's one. To apply the diversification multiplier, we start with giving equal volatility weightings to each group. We then multiply the raw weight of each group by it's diversification multiplier. Then, because our weights will now add up to more than 1 we normalise them. Looking at this spreadsheet you can see this produces weights of 53.5% in group AB, and 46.4% in group C. A and B end up getting 26.8% each, and C gets 46.4%. It's probably fine to assume we can forecast volatility perfectly, as we effectively do by using the inverse volatility weighting method. I'm less confident doing so with correlations. Two sided 95% confidence intervals for a correlation of 0.0 with 100 observations are -0.2 to +0.2. For a correlation of 0.5 they are a bit narrower: 0.34 to 0.63. That's a fair bit of uncertainty; for the group AB the diversification multiplier could be anything between 1.11 and 1.22. In my first book, Systematic Trading, I suggest a heuristic method to allocate to groups with non equal correlations (for equal correlations it still makes sense to use equal volatility weights, even once uncertainty is considered). The method works for groups of up to three assets; and does by trying to match the correlation matrix to a limited number of possible candidate matrices. There are 7 candidates, essentially forming the possible combinations (order unimportant) when correlations can take one of three values: 0, 0.5 and 0.9. Once the candidate matrix has been identified you just read off the appropriate weights. These weights have been calculated allowing for the uncertainty of correlations, and . 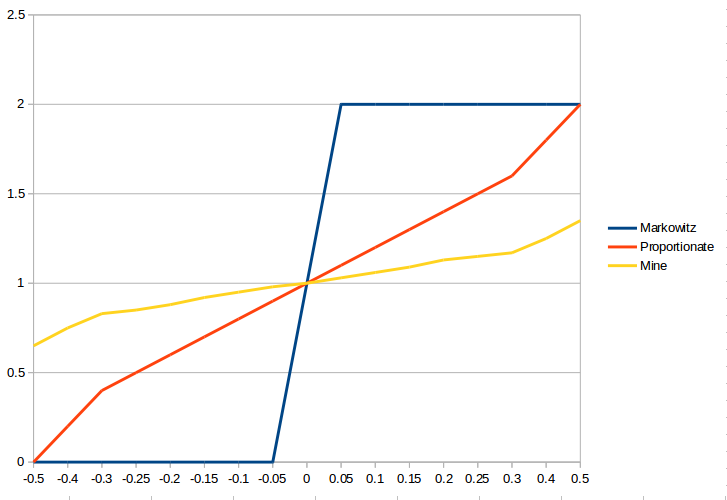 For our simple example which matches a candidate exactly this method would produce weights of 30% in A and B, and 40% in C.
Notice these are a little different from the weights I calculated above (26.8% in A and B, and 46.4% in C), the difference being that the heuristic weights allow for the uncertainty of correlations, and so are slightly closer to 1/N. This doesn't match any of the candidates... so what should we do? First we need to calculate a similarity value between the correlation matrix and each candidate. A good way of doing this is to measure the distance using differential version of the Frobenius norm (don't panic this is just the root of the sum of the squared differences between matching correlation values). A similarity value would then be the inverse of the distance. Once we have a bunch of similarities we normalise them so they form weights. We then take a weighted average of the weights proposed by the candidate matrices. Here is a simple example showing how we'd deal with the matrix above. I've included just a couple of candidates, one with all zero correlations, and one which is identical to the first example (with 0.5 and zeros in it). In theory this is possible with a spreadsheet, but in practice you probably wouldn't bother with this interpolation method if you were running this by hand. A good group is one which contains similar correlations. These don't have to be especially high, although it's likely that the most granular groupings will contain highly correlated assets. But for the purposes of portfolio construction we don't really care if a portfolio contains assets that are all have zero correlation with each other, or which have 99% correlation with each other; in both cases the optimal portfolio will be equal volatility weights (assuming - still - that we can't predict Sharpe Ratios). Indeed by the time we get to the highest level groupings (bonds and equities in the simple example above) the correlations will probably be relatively low. Failing that we'd like to see groups that match closely to the candidates above. We'll consider the joint grouping of trading strategies over multiple instruments in the final post, as this is an empirical question (for myself I currently allocate weights to strategies for a single instrument, then allocate to instruments - but you could do it the other way round, or jointly). There is more detail on possible groupings in my first and second books. To back-test we need to be able to create groups automatically. Fortunately there are numerous techniques for doing so. This is a nice notebook that shows one possible method using out of the box scipy functions (not mine!). We can set a cluster size threshold at 3, allowing us to use the 'candidate matching' technique (as this works for 3x3 correlations). The natural risk of this bad boy is a pathetic 3.21%. So we're back to the problem we have earlier - without access to leverage this is waaaaay too low for most people. However the nice closed form formula that we used earlier to solve this problem only works for 2 assets. To deal with this we need to partition the portfolio into two parts: a high risk part, and a low risk part. The low risk part will contain all the assets with risk less than our risk target. The high risk component has all the assets with risk higher than our risk target. We then treat these as our two top level groups; and allocate within them as normal. Finally we use the original technique above, where our two 'assets' will be the two groups. For this simple example (see here) let's suppose we're targeting 10% risk. The low risk group happens to contain all the bonds, whilst the high risk group contains all the equities. We do our allocation in the normal way, and end up with a bond portfolio which has a standard deviation of 2.26%, and an equity portfolio with risk of 16%. Then using the closed form formula we get a solution of 62.2% in equities and 37.8% in bonds (cash weightings). Warning: if we have too few assets in the high or low risk group then we could end up with a portfolio which is unnecessarily concentrated. The last technique was effectively a use of constraints. It's trivial to impose either cash weighted or volatility weighted constraints in any part of a handcrafted portfolio. We've dealt with volatility and correlations; however we're still assuming that Sharpe Ratios are identical across all assets. Sharpe Ratios are very hard to predict, and their parameter uncertainty is substantial. But we might have some useful information about Sharpe Ratios, some conditioning information. For long only asset allocations we might want to use some kind of trading signal; value, momentum or whatever. You might believe in CAPM and want to use the residual part of Beta that isn't covered by inverse volatility weights. You might not believe in CAPM and want to use a 'betting against Beta' thing. You might believe that you are the king of the discretionary stock pickers, and want to make your own forecasts. For trading strategy allocations I personally prefer to keep potentially poor strategies in my back test, and then allow the back test to weed them out (otherwise my back test results will be inflated by the absence of any ideas I've thrown away). But to do this we need to include historic Sharpe Ratio as an input into the optimisation. The blue line is a stylised version of what the Markowitz optimiser tends to do; either allocate nothing or everything as the Sharpe changes just a little. A more sensible idea might be to adjust weights proportionally with the Kelly criteria as shown with the red line. Assuming the average SR of the group is 0.5, we give something double the normal weight if it has double the average SR, the same weight as the average if it has the same SR as normal, and a zero weight if it has a zero SR. The red line assumes we know exactly what the SR is. We don't. If we factor in a reasonable amount of uncertainty we end up with the yellow line. Even if the estimated SR is pretty shocking we'd still end up with some weight on the asset. This is a nice heuristic, which does a pretty good job in the face of massive uncertainty. To use it (as outlined in "Systematic Trading" and "Smart Portfolios") you begin with some asset weights (volatility normalised works better and is more intuitive). You then multiply these by the conditioned multiplier depending on the Sharpe Ratio. Some weights will go up, some down. You then normalise the weights. In the next post I'll explain how you actually apply the handcrafting method, both manually, and with some python code.